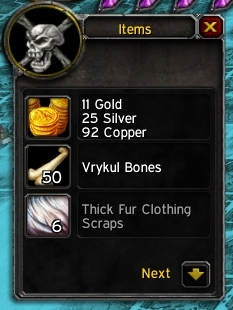 Frostweave Cloth farming in World of Warcraft has always been a nice way to make some fast wow gold. It's needed in oh-too-many recipes, so there seems to always be a lack of it in the auction house. This makes it's price very high usually. You may already be aware of the old Converted Hero Frostweave Cloth farming tip, but I like this "new" method more, as these mobs respawn instantly and I don't even need to move around! I haven't seen even any competition here, for now. There are many great Frostweave Cloth farming spots. This is my favourite because it's a secluded spot in Icecrown. Dot, Dot, Dot, Dot. Repeat. Loot! This method focuses on killing level 80 non-elite Vrykul non-stop. These all drop up to 4 Frostweave Cloth and lots of different items, including over 30 silver each. Also, a level 80 Northrend creature has a small chance of dropping valuable loot, including Damaged Necklaces and Books of Glyph Mastery. 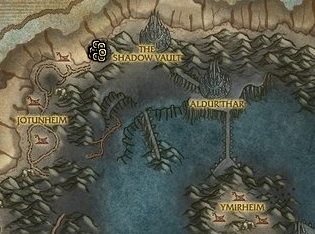 The Vrykul you're going to farm are located in Icecrown, Savage Ledge. This place is next to The Shadow Vault flightpath, mailbox and vendors, so it takes only a moment to to sell the greys and mail other stuff to your bank alt. My strategy as a Warlock is to go affliction and stand in the middle of the area where they spawn and simply corrupt each mob (More dot damage and self heals). The trick is to not instakill them, but to lure them to where you are standing, and die by the time they have arrived. One corruption is more than enough to kill a Mjordin Combatant. When they are all dead, 4 more have respawned. When those are dead too, 4 more spawns. The spawns are unlimited and instant, so there's no waiting required. Thank the maker for AOE loot! In just a few minutes you will be knee-deep in Vrykul corpses.